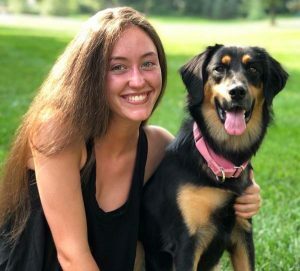 Dog Joy - Volume 1 was published by 17-year old high school student and dog lover, Caroline Capuzzi in the summer of 2018. It is a collection of heartwarming stories told by the caring individuals who have opened their homes and hearts to deserving dogs in need of a forever home. Each story is shared to inspire others to consider dog rescue and adoption when it comes time to add a four-legged member to your family. 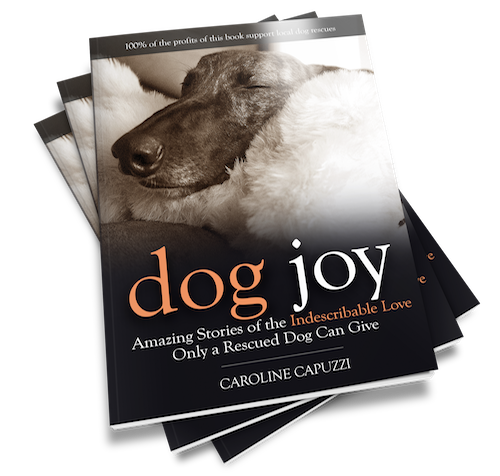 100% of the profits from Dog Joy go to supporting a number of the rescue organizations featured in the book. Stella was rescued from the Greenmore Farm Animal Rescue in West Grove, PA.
Roxy was rescued from the Chicagoland Dog Rescue in Chicago, IL. Soli was found in Memphis, TN by Sandra McGuckin who founded the Stray Network Anmal Rescue. Cado was found in Blackshear, GA by MaryBeth Yannessa who is president of the Animal House Project. Kahlua was rescued from the Don't Bully Us Rescue in Philadelphia, PA.
Willy was rescued by Mike Caldwell just days before he was to be euthanized. Napa was rescued at the Best Friends Animal Society in Kanab, UT. Calvin was adopted through the Homeless Pet Foundation, located in Marietta, GA.
Dodie was found and saved by Dr. Ivan Carney while driving to work one morning. Bruno was rescued from the Baltimore Animal Rescue and Care Shelter in Baltimore, MD. Sophie was rescued from the Lawrence County Humane Society in New Castle, PA.
Jager was adopted through the Useless Bay Sanctuare in Seahurst, WA. Pearl & Mattie were both adopted from the Animal Protection Society of Caswell County in Yanceyville, NC. Mona-Lisa was rescued from Linda Ann's Greyhound Adoption in Allentown, PA.
Simba was adopted from the Rocky Mountain Lab Rescue based in Denver, CO.
Joey Quacamole was rescued from Fulton County Animal Services in Atlanta, GA.
Sophie was adopted from Dog Town Rescue in Colmar, PA.
Zeus was rescued from BullyWag in Douglasville, GA.
Minnie was rescued by David Lee after being inspired by a video created by Hope for Paws. Emanuel was rescued from the Animal House Shelter in Huntley, IL. Gizmo was adopted from the Berks Animal Rescue League, located in Birdsboro, PA.
Rusty was rescued from First Coast No More Homeless Pets in Jacksonville, FL. Cartwright was adopted from the North Shore Animal League America in Port Washington, NY. Dixie was rescued by Leslie Elhai after being found wandering the streets by a friend. Prince was rescued by Frank Zuniga after he found him in the streets of Austin, TX . Milly was rescued from the Livingston County Humane Society and Rufus came from the Huron Valley Humane Society, both in MI. Do You Want to Have Your Dog Rescue Story Featured in the Next Dog Joy Book? If you would like to be considered as a Dog Joy Contributing Author in the next Dog Joy volume, click on the button below and enter your information and we will let you know about all the details. This is fun and rewarding way to share your story of your beloved pet with the world. If you are part of a dog rescue organization and would like to publish your own version of Dog Joy, featuring stories from your adopters, please visit DogJoyBooks.com. These books are an excellent way to raise awareness and funds!